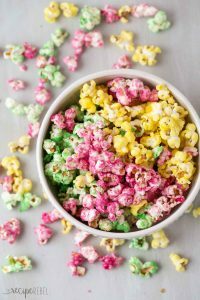 Grandma's Candy Popcorn recipe & a Giveaway! My Grandma’s Candy Popcorn is a must-make every Christmas! It’s fun and colorful and the kids love it 🙂 Choose any colors to switch things up for game day, a birthday party or any other holiday. SO easy! Includes a step by step recipe video. I’m going to be completely honest. As soon as September rolls around, I’m waiting for Christmas. It’s not that I want to rush the snow, or the cold, or the snowsuits and icy roads. But I think Christmas is my favorite time of year. I feel like such a child saying that, you know? I promise you it’s not all about the Lego waiting under the tree. It’s just that there’s nothing else we prepare for so far in advance. By the middle of November, for sure, I’ve got the Christmas tree and decorations up and am well into my Christmas shopping. I love buying, wrapping and giving gifts. I love a holiday that requires weeks of baking in advance (No Bake Christmas Trees or Brown Sugar Pecan Cookies anyone?). I love the lights, the first snowflakes, and s’mores over the fire (inside!). This is my Grandma’s Candy Popcorn recipe, and it’s one I’m sure I’ve eaten every Christmas since childhood except the last. Since my Grandma passed away last November, I find myself becoming more emotionally attached to family recipes. For some people, maybe that’s strange. But for you fellow food lovers, maybe you can see the significance of cooking or baking the same things that your parents and grandparents made years — or decades — earlier. I hope to store up a good number of them here! This recipe is really simple, and can easily be customized. You could add flavored extracts if you wanted, change up the colors for any birthday, game day, or holiday, or mix in things like sprinkles, nuts, candies, etc. The options are endless! 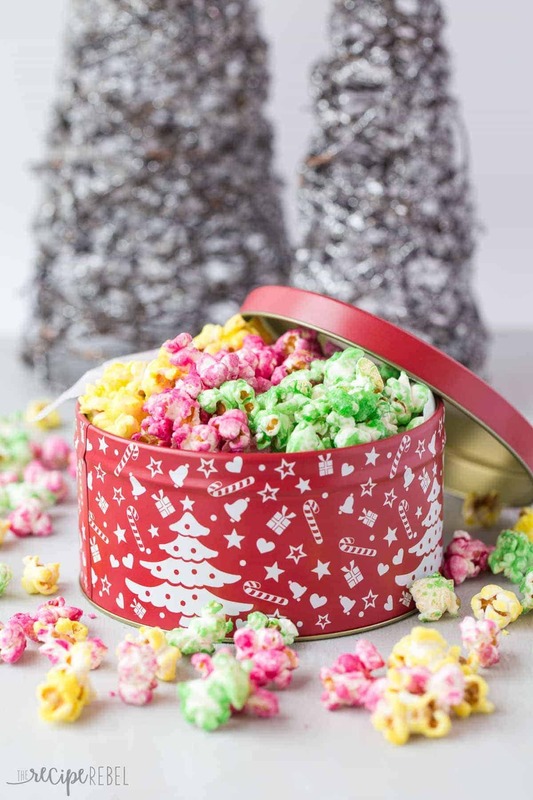 Candy Popcorn is an easy holiday treat that is perfect for gift giving! My Grandma's recipe ? In a medium pot over medium-high heat, bring sugar, water, and butter to a boil. Reduce heat to medium and boil, stirring constantly, for 3 minutes. 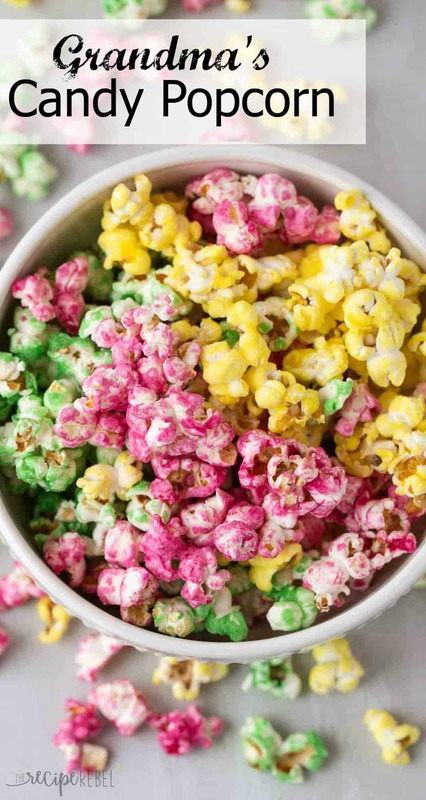 Stir in food coloring and salt and pour over popcorn, stirring to coat (make sure you work quickly!). Spread on baking sheets lined with wax paper and let dry for 1-2 hours until no longer sticky. *This popcorn lasts a long time at room temperature in an air tight container! It'll be good for at least 1-2 weeks. *I divided my popcorn in 3 to get 3 different colors. I divided my sugar mixture (after boiling) into 3 bowls, then stirred in ½ teaspoon food coloring in each bowl, and pour that over ⅓ of the popcorn each. Grandma’s Candy Popcorn and a Giveaway! *This popcorn lasts a long time at room temperature in an air tight container! It’ll be good for at least 1-2 weeks. *I divided my popcorn in 3 to get 3 different colors. I divided my sugar mixture (after boiling) into 3 bowls, then stirred in 1/2 teaspoon food coloring in each bowl, and pour that over 1/3 of the popcorn. Just made this in Easter colours for our huge Easter egg hunt for about 25 kids coming to our acreage tomorrow. I am mixing it with plain popcorn so that it’s a little more fun and they can eat a lot More without a sugar overload. Thanks for the recipe. This one is a keeper.. This is delicious….tastes like a popcorn ball. I was worried about it really drying and not being sticky, but it was perfect and crisp in about 30 minutes! My favorite Christmas treat has to be my mom’s butter crunch (toffee). 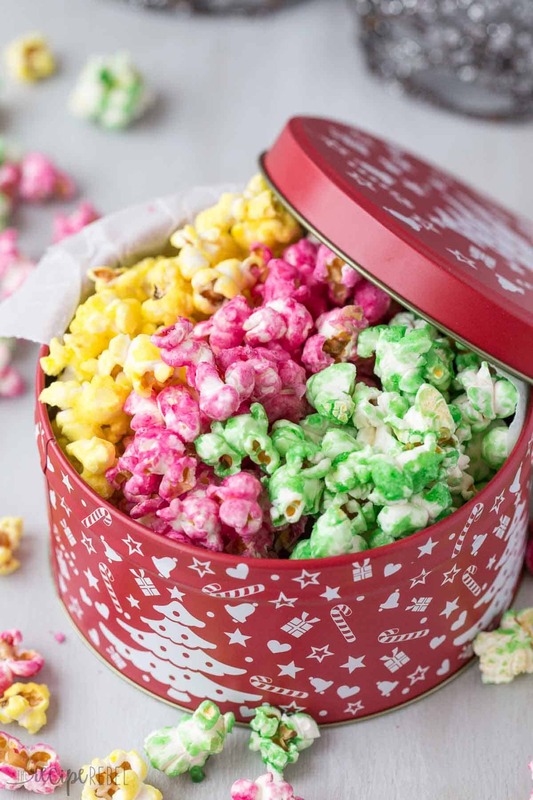 Anyways, this popcorn looks delcious – perfect for gifts! Omg l dint mines it was so delicious my aunt like so much thank for the recipes. Thanks Francia! SO glad you liked it! I just tried this recipe and it’s easy and tastes good. My husband helped with the pouring of the sugar mixture. Thanks for sharing. I’m so glad to hear that! Thanks Natiesha! Have you ever halved the recipe with success? I don’t really want that much yummy stuff around to mindlessly eat. Love my moms divinity! And my grandmas carmel popcorn balls. I can’t wait for my mothers annual gumdrop cake she makes during the holidays! My favourite Christmas treat is peanut butter fudge. My Favorite holiday treat is everything peppermint! are little fried balls of dough that have honey on them. It is an Italian recipe. My favorite holiday treat is rugelach! My favorite Christmas treat is my mom’s recipe for pecan crescent cookies. Just wish she was still around to make them. Sugar cookies are the best. My mother makes an excellent short bread….the best! Scandinavian Rosettes – my Grandmother started this traditional family favourite that continues with our newest generation. I just love those family recipes! Christmas Eve after driving arouond looking at lights, we settle at home to watch Christmas movie and have peppermint hot chocolate. We snack on Peanut Butter Blossoms, macarrons and usually a snack mix my husband makes. I look forward to that every year. That sounds like the perfect evening! Thanks for sharing Darlene! Christmas is one of my favourite times of the year too! As for a Christmas treat I’d have to say either caramel popcorn with cashews or confetti squares! I think I’ll be trying this recipe out this year though! Thanks Melissa! Those confetti squares are so much fun! My favourite Christmas treat is New York Delight. Traditionally it’s Rollerblade crushed cornflakes but we love it dipped in chocolate!! Wow, that sounds really interesting! I’ll have to try it! I love homemade Sugar cookies for Christmas. It’s a childhood favorite! I love chewy gingerbread cookies! Would love to try this popcorn maker! I remember having one when I was younger and loved the sound of popcorn being made and the family time afterwards. Thanks Lillian! 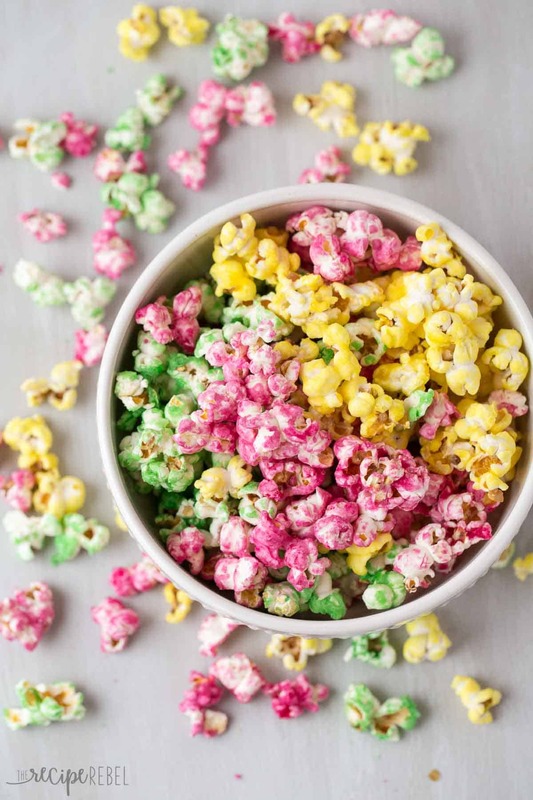 Popcorn is such a great snack for those times! My favourite is buttery shortbread. Mmmmm, yummy!! I love cookies that my mother in law makes every year and they’re called spitzbuben! A sugar cookie sandwich with apricot jam in the middle. Delicious! Sorry to hear of the passing of your Grandma. My favourite treat is Shortbread. I save up all eat as as much as I want until they don’t have anymore. I love shortbread cookies during the holidays. I can’t wait to start baking! First off….now I have to go and find some lucky elephant popcorn stat. But favourite Holiday recipe….Crostoli, super easy to make…but you need to make a lot. All it is is fried pasta sprinkled with icing sugar. You roll the past out thinner than normal and it’s always a family favourite. I love homemade carmel popcorn! I like pretzel toffee a lot. Sweet and salty is my favourite. Homemade cracker jacks, shortbread and cream cookies with pink icing and flaked coconut. !